Portugal won their first-ever major tournament courtesy of Eder’s stunning long-range strike in extra-time, after a defensive-minded first 90 minutes. Fernando Santos brought back Pepe after injury, and William Carvalho after suspension, so Bruno Alves and Danilo dropped to the bench. Cristiano Ronaldo didn’t make it to half-time until being replaced by Ricardo Quaresma. Didier Deschamps named an unchanged XI, meaning no return for N’Golo Kante. Overall this was a disappointing match, shaped heavily by the early departure of its best player, Ronaldo. The graphic below illustrates the line-ups after his departure. France had the better of the opening 90 minutes, but Portugal pushed forward impressively in extra-time. In formation terms, it was as expected from the outset. 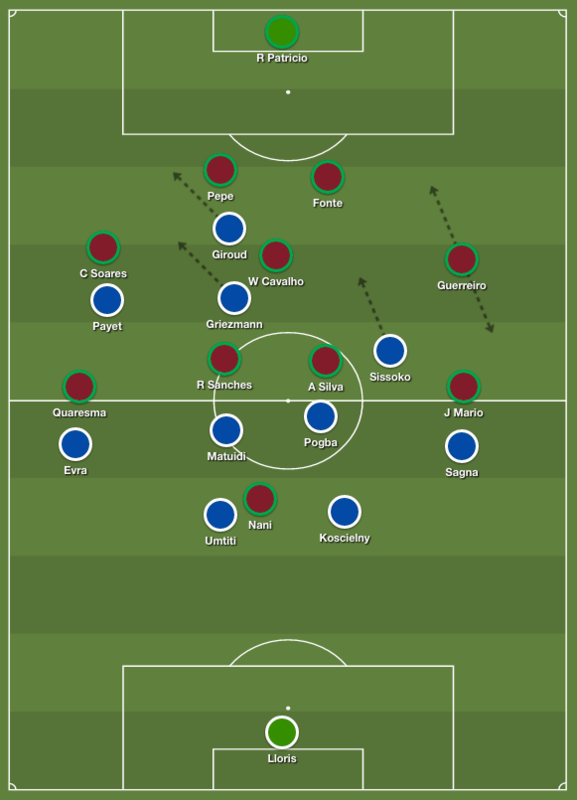 Both teams were arguably in 4-4-2 systems, with some nuance: Portugal’s midfield looked more like a diamond at times, in keeping with their previous performances, with Adrien Silva shuttling forward and leaving Carvalho minding the defence. When France had long periods of possession, Portugal’s diamond squashed into a flat four-man shape. France’s system is arguably more 4-2-3-1 than 4-4-2, but Antoine Griezmann played high up the pitch, more of a second striker than a number ten. With Carvalho sticking tight to him, Griezmann generally had his brightest moments when running in advance of him, rather than dropping deep. The match started at a good tempo, with France pressing high up the pitch and forcing the Portuguese defence into some mistakes in possession. Pepe, who would eventually become the game’s outstanding performer, looked particularly uncomfortable in the early stages, as Portugal struggled to work the ball forward into midfield. Portugal had the first good chance of the game, however, with Cedric Soares playing a long ball over France’s high defensive line to Nani, who blasted over. 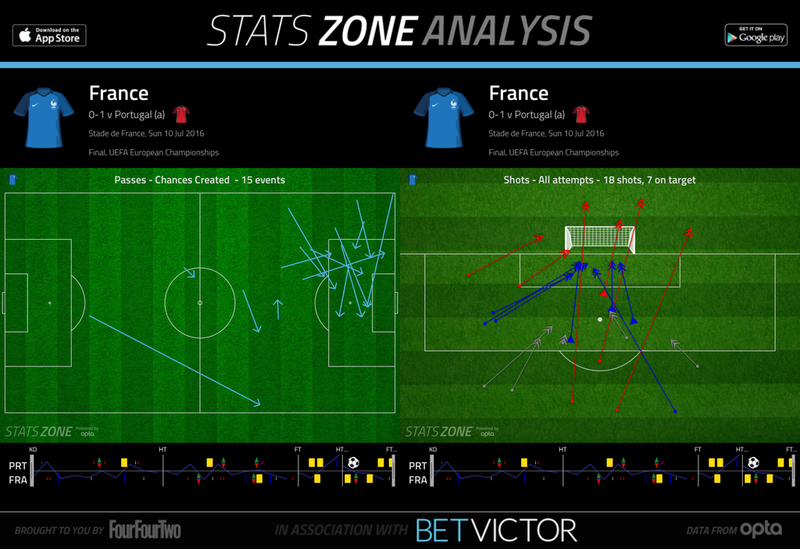 France’s determination to close down quickly created their first chance chance, and caused the game’s key moment. For the chance, Olivier Giroud closed down Pepe, who slipped, with the ball falling to Dimitri Payet. His chipped ball into the box was headed towards goal by Griezmann, forcing Rui Patricio into a fine save. The game’s key moment, meanwhile, was Ronaldo’s injury. Payet pressed him very aggressively, winning the ball but colliding with Ronaldo. After two attempts to continue, he was replaced by Quaresma. This changed the game completely. For a start, France’s early momentum wasn lost – with the start-stop next 15 minutes largely based around whether Ronaldo could continue. Portugal, meanwhile, changed system after Quaresma’s introduction and switched to a 4-3-3 system, with Nani playing upfront alone, Quaresma on the right, Renato Sanches tucking inside and Joao Mario pushing forward. It would be ludicrous to suggest Ronaldo’s injury actually helped Portugal, but it’s certainly true that it affected France’s rhythm and allowed Portugal to slow the tempo, which suited them better. The first half’s best performer was a player slightly fortunate to have played his way into the XI. 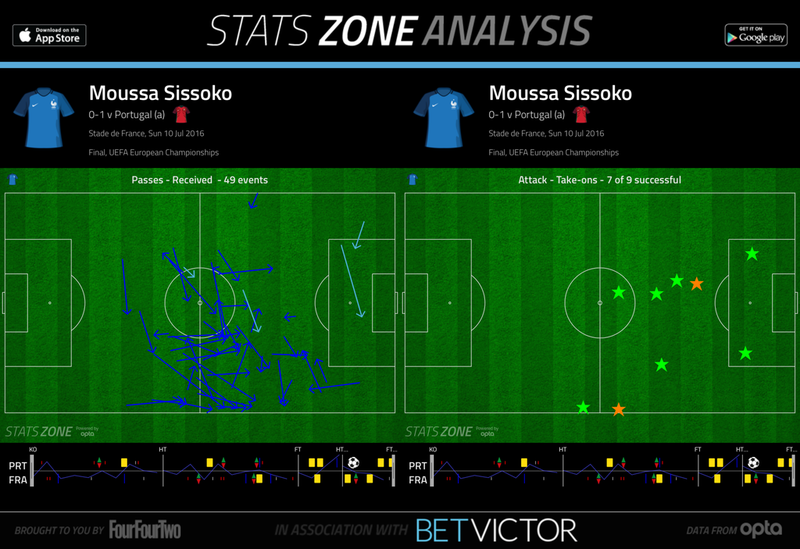 Moussa Sissoko was only starting as a consequence of Deschamps sacrificing Kante in order to play Griezmann in his favoured central position, but he was very dangerous throughout the first half by playing in a narrow right-sided midfield role. No-one really knew how to stop Sissoko – Silva and Sanches were concentrating on Paul Pogba, who was quiet in possession, and Blaise Matuidi, who was very good in a defensive sense but offered little going forward. Raphael Guerreiro stayed in his left-sided zone rather than moving inside to stop Sissoko, so he was often able to burst past opponents and into space. His end product was inconsistent, but he was the only player attempting to beat opponents. 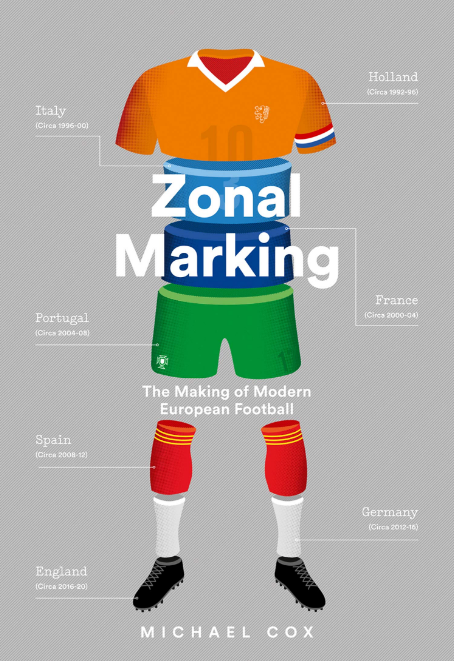 However, France’s best moves came down the left – and this was the game’s defining feature. As the graphic of France’s ‘chances created’ and ’shots’ demonstrates, there was a heavy emphasis upon working the ball down the left flank. There were two reasons for this. For the first hour, Portugal right-back Cedric Soares often stuck too tight to Payet, which opened up space in the inside-left channel for both Giroud and Griezmann to run into. Two of France’s best attempts were hit by those two strikers from almost identical positions, both saved by the impressive Rui Patricio. Patrice Evra was also sporadically exploiting the space on the overlap. Second, Deschamps replaced Payet after an hour, introducing Kingsley Coman. The Bayern winger showed his usual directness in possession, dribbling at Soares and creating chances when turning inside, most notably for another Griezmann chance in the air, which he headed over. Substitutes proved crucial here. Santos brought on Joao Moutinho in place of Silva, meaning Portugal moved the ball more intelligently towards the flanks, and started to compete on even terms with France for the first time in midfield. Most crucially, however, both managers sent on a striker with ten minutes of normal time remaining. Andre-Pierre Gignac replaced Giroud, while Eder came on for Sanches, with Joao Mario moving inside and Nani switching to a wide role. These players would be crucial. Gignac was nearly the hero, receiving a low cross from Evra, turning past Pepe, and scuffing a shot against the near post. Portugal, however, were the better side after these strikers’ introduction. Eder gave Portugal an entirely different option upfront, and was brilliant at holding up play, outmuscling the French centre-back pairing and continually winning free-kicks. He enabled Portugal to get up the pitch and spend long spells in the opposition half. The initial solution to Ronaldo’s departure, using Nani upfront, plainly didn’t work, but Eder’s introduction made Portugal cohesive again. With ten minutes of exta-time remaining, Eder received a short pass from Moutinho, turned past Laurent Koscielny, and smashed in the winner from 25 yards. In the contest of extra-time, he was a fitting matchwinner. The most important goal in Portuguese football history has been scored by a strong, back-to-goal number nine. That’s bizarre considering Portugal’s lack of a proper centre-forward has been their primary weakness for years, and even more peculiar considering Santos had determinedly built a system without a proper striker, such was his lack of faith in Eder. Indeed, this is a stange Portuguese side overall. Santos built a team that is defensively disciplined despite being unusually fluid in midfield, and a team that lacked proper width despite its best attackers being natural wingers. It has somehow come together nicely, and is a testament to the importance of not losing – in 90 minutes, Portugal’s record in this competition is W1 D6 L0. Portugal only conceded one goal during the knockout stage, and this is the fourth consecutive European Championships where the best defence has won the trophy. Greece in 2004, and Spain in 2008 and 2012, didn’t concede a single knockout goal. 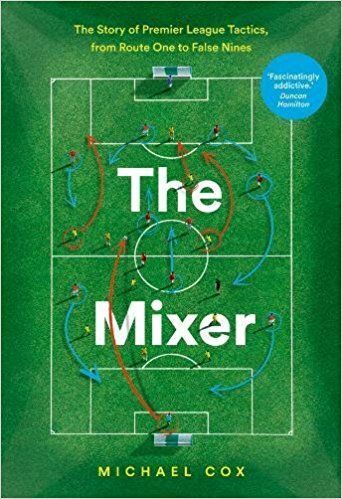 It’s difficult to pinpoint Portugal’s true attacking style, although both Ronaldo and Nani – as well as Eder, eventually – provided decisive moments in the box. Deschamps will be criticised for his uncertainty throughout this competition, rarely finding his best system and often having to correct things midway through matches. He failed to find a system which used his two star players, Antoine Griezmann and Paul Pogba, in their optimum roles – Greizmann needed the 4-4-2 / 4-2-3-1 to play off Giroud, Pogba needed a 4-3-3 to drive forward from midfield. But these tournaments come down to very fine margins, and Deschamps’ decision to select the system which benefited Griezmann made sense considering his form in this competition – and ultimately, Deschamps can’t be blamed for the tournament’s top scorer being unable to convert good chances in the final. I agree on the lessened defensive responsibilities, but I can’t believe that Portugal would have played in this manner had they boasted a top-class number nine. You are probably right. In Russia we might finally have one in the likes of André Silva (20 years old) that will play his first complete senior season in Porto. Strong forward with excellent technique, capable of both holding play and poach. What I don’t get is why Santos went away from playing Eder with Ronaldo upfront. Ronaldo has never been good playing as the main striker and nor has this tournament showed otherwise. Playing him alongside Eder could have maintained some of the same defensiveness while still having an outlet as well as somebody to allow Ronaldo to run across in the box as a dummy. Watching Ronaldo through the years would have made this obvious yet Santos had no idea. The truly remarkable thing about Santos is that he built a solidly defensive side while continually getting the offensive part wrong. Portugal had technical players but was implausibly poor in passing/dribbling moves. Nor were they a good counter attacking side despite this logically needing to be their main forte. I have no problem praising defensive coaches or defensive matches and I infact enjoy this aspect of football. Santos doesn’t deserve the plaudits he is given(aside from defensive structure and apparently man management). Contrasting him with Conte is quite instructive. Conte had worse players than normal so Conte drilled some moves to compensate. Santos had no plans and nor did he have the ability to adjust this major flaw in Portugal’s play throughout. It is remarkable that Eder was used so little even if he would have been much less impactful against most Portugal’s previous opponents that would have sat back. I wouldn’t consider a side with 86% passing accuracy a poor passing side. As for dribbling, combination play is way more effective I would say. Passing is not only measured by completion rate but by its ability to get through the lines and get around defenders. Portugal were pretty awful in this regard and I have seen all their games. Just take the final as an example. Portugal’s many passes were incredibly horisontal and cautious and when they reached the middle or last third of the park there was little invention and creativity. My complaint is not that Portugal was too defensive per se but that they were simply terrible going forward and furthermore that they had little excuse for being so bad offensively. Unlike lesser sides Portugal had dribblers and passers who could do better but offensively they were remarkably in-cohesive. Santos had neither a build up plan nor a counter attacking plan. His idea seems to have been to work on defensive structure and hope that by sticking Ronaldo+Nani upfront it would work itself out somehow. Santos was quite lucky in this regard and the results show this as well. Portugal didn’t have a single great performance in this tournament where they were good defensively and offensively. Look at highlights of Greece to see just how marginal Portugal’s victory was in the end by contrast. I’m not terribly impressed by this Portugal victory. I’m quite happy Portugal won by the way but I don’t have a high opinion of Santos or this side. With that said Portugal can do much better with those players and hopefully no more of this Ronaldo-Nani partnership. In your opinion, how exactly would Eder playing with Ronaldo upfront have looked like, formation-wise? The last two tournaments, Portugal played a 4-3-3 with a sub-par CF (Eder / Helder Postiga / Hugo Almeida) and Ronaldo and Nani on the wings (Ronaldo free to do as he likes, Nani with far more defensive duties), and it never really worked that well. A classic 4-4-2 (or even a variant of the Welsh 3-5-2) would mean sacrificing Nani, who’s always been decent for Portugal. I think the ’strikerless’ 4-4-2 was actually a pretty good idea, even if I agree more work on transition play and passing moves would definitely have improved the performance. Then again, the whole midfield has only just come through into the team, so the players haven’t had that much time to gel, and there’s only so much a manager can do ahead of a tournament. I can’t believe you are critical of Fernando Santos when he has delivered the Euro title to Portugal. You can’t say he was wrong not to select Eder from the beginning based on an impressive 40 mins in the Final against tiring defenders, when he has not impressed in his previous caps. Substitutes truly turned this game, Eder’s introduction allowed Portugal to change system and deal with France’s wingers, and offered them some hold up play. In your conclusion you touch on France not being able to find a system to get the best out of both Griezmann and Pogba – could there be an argument for the implementation of a 3-5-2? This also addresses their relative lack of depth in the fullback positions going forward, and allows for more opportunities for their excellent young CB depth – Varane, Zouma, Umtiti, Laporte, to name 4 players who could all be seen as future starters. This. Deschamps should have sacrificed Sissoko, but he chose to sacrifice Payet instead. A 4-2-3-1 with Kante holding, Pogba creating, Payet and Matuidi wide, Griezmann second striker and Giroud up front would have been the better both for Pogba and Griezmann, and would also give defensive cover against counters. did you copy my analysis . i posted this here on http://rahultactics.blogspot.in/. Eder’s introduction was inspired, but Santos waited way too long to make that change, a feature that was seen in his Greece side at WC 2014. France played with 2 very similar centre-backs: Koscielny and Umtiti which are both pacey and good on the ball in open play. Had Deschamps fielded Rami instead who is physically stronger and better in the air, it would have been much easier for France to defend against Eder, in my opinion. Also, can we acknowledge the elephant in the room that is France’s lack of a proper playmaker? It’s actually quite ridiculous if you think about it. There was zero guile or intelligent working with the ball for France in the entire game. It’s quite ironic actually, given that that was France’s gig in 2006 with Zidane. If anything, they could have played Cabaye or Schneiderlin for some extra quality on the ball and drop Sissoko, then hand Sissoko’s place on the field to Pogba who would have been more effective. Instead they fielded 3 very similar players who are all stamina and dynamic runs up and down. Deschamps’ decision to press so high and for so long, in mid-July heat, and without having a player in the holding / spare man role – Kante was badly needed at least in the later part of the game – proved catastrophic as French physical collapse was evident after the 75th or so. Judging from Deschamps’ overall mindset during the tournament, I assume he would’ve put Kante in only when France were leading. Totally agree on Eder’s introduction deciding the game. This was a change one would expect from a manager of the Mourinho-Simeone-Guardiola calibre, I for myself didn’t expect Santos to make such a bold move – while his team were good for keeping the score at 0-0 with the 4-1-4-1, the 4-3-3 gave much more attacking threat without derailing the midfield, rather strengthening its defensive capabilities. And at last we saw Nani play in his true position! With all of this, I still believe a French win was imminent with Ronaldo in the game. The original Portuguese diamond was about to crumble sooner or later, and during France’s long spells of pressure, having a player doing absolutely no defensive work – even if his name is Ronaldo – is very dangerous. Whisper this quietly, Portugal got lucky with his injury. Now, continuing a discussion Michael started on Twitter about the plethora of good managers Portugal produces in the last years, my top 5 Portuguese managers currently are Mourinho, Jesus, Santos, Jardim and Vitoria. Especially Vitoria would be a great choice for NT manager when Santos leaves (Jesus has stated that he wants to coach the NT after he wins a championship with Portugal’s Big Three, but by that time he must be around 67 years old). Some of the new blood (Nuno, Fonseca and Conceicao) have all the potential to be great managers in the future. Others, though, are wildly overrated and overprized (V. Pereira, V. Boas, M. Silva for example). Anyway, props to Jorge Mendes for promoting all these Portuguese managers and players, good or bad, and taking them around Europe. What would have Conte done with this team in his 3-5-2? I don’t believe Portugal lacked proper width. True they didn’t play with wingers but there was plenty of width in their attacking play, which i believe the heat maps would back up, they attacked down the left and right as well as centre. The large number of crosses played will support this. Where they lacked creativity was in the centre, especially when Moutinho wasn’playing. Notably the best they looked as an attacking force through the centre was against Hungary when Joao Mario moved into the number 10 role late in the game, though this may have been more to do with the opposition.